So first off, I wanted to tell you that these prints are available in the Etsy shop Poppy and Pinecone, and they're amazing. I found them when I was searching for this graphic. I need some! But on to today's post, I have some exciting news! Andrew and I have a trip booked in early July to Boston, Cape Cod, Nantucket and Martha's Vineyard. As part of my birthday present, we're going to spend a night in Boston and catch a Red Sox-Cubs game. I'm SO excited! I've never been to Fenway and as a big baseball fan, it's a must. 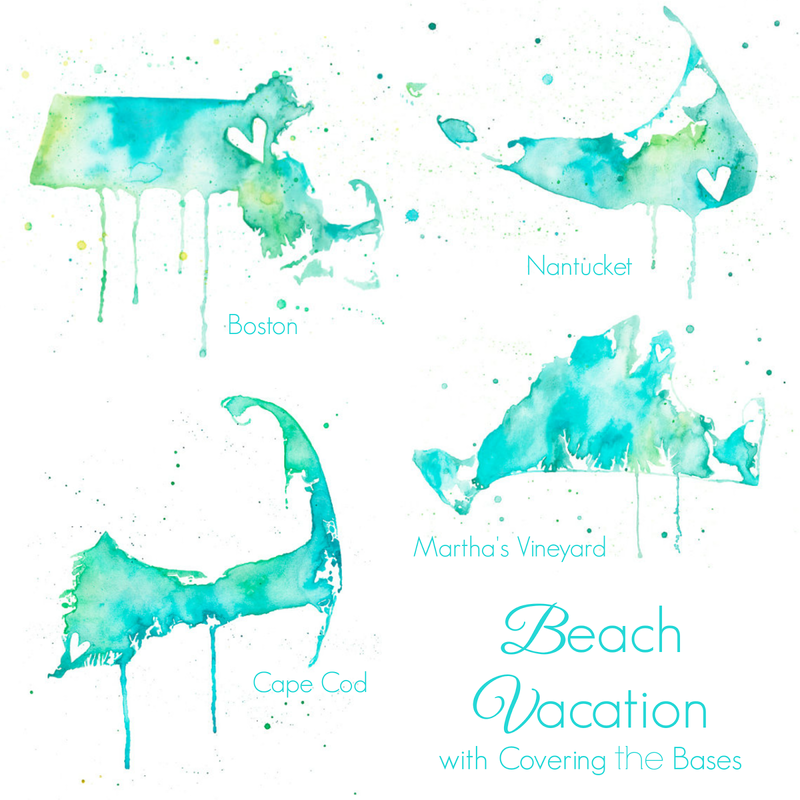 Then we'll be heading to The Cape, Nantucket and Martha's Vineyard. I've never been to Massachusetts before so this whole trip will be new to me! I NEED YOUR HELP! I want to hear fun things to do, cool things to see, anything to stay away from, places to eat, everything! So let me hear it. We made reservations for a sailboat ride in Nantucket, but other than that we have nothing planned. Something Natural: Casual sandwich place on Cliff Rd. They bake their own bread (try the famous portuguese). Cutest spot to sit at a picnic table and enjoy the beautiful island. Juice Bar: Best homemade ice cream ever. All the flavors are amazing, can't go wrong. Be sure to try one of the freshly made waffle cones! Millie's (in Madaket): Tacos, quesadillas, salads, and margaritas! Chips and guac is also excellent. Beautiful place to enjoy the famous Madaket sunset. The Hub: Newsstand right in the middle of Main Street. Full coffee bar along with all your papers. Cute gifts as well. In terms of shopping, you can't go wrong with anywhere really. Wander up and down Main St, Centre St, and down to the wharfs. Lots of cute little places for clothes, accessories, shoes, jewelry, home goods, and gifts. I could go on for days. Basically you'll have a great time no matter where you end up! If you're going to be in Boston for brunch, go to the South End Buttery. Their brunch cocktails and food is out of this world! and loved the little shoutout at the end, i LOVE our little back and forth responses! have a wonderful weekend pretty lady! Your trip sounds amazing! I live south of Boston and have had a wonderful time exploring these areas. Fenway is such a great ballpark. You'll have to grab food from the street vendors and enjoy the atmosphere along Yawkey Way before the game. Jerry Remy's is a great place to go on game day too. As well as Game On or Boston Beer Works. Martha's Vineyard is so relaxing. I loved watching the sunset from Nancy's Restaurant last summer, as well as renting bikes for the day and riding around the "gingerbread houses". I'm also inspired to go back to Nantucket based on the comments above :). Have so much fun! Definitely go to Menemsha in Martha's Vineyard. It's the very quiet end of the island but so worth it. Cute little shops, the beach plum and home port restaurants both have great food. And be sure to stay for sunset! Those were some of the most breathtaking sunsets I've ever seen!! Hope you have a great time!! Relax on the beach - one of my favorite activities. But it is necessary to prepare! Be sure to bring your game, book, good and comfortable beach chair (look here http://www.beachgiraffe.com/best-beach-chairs-reviews/), umbrella, a remedy for sunburn. And everything will be fine!